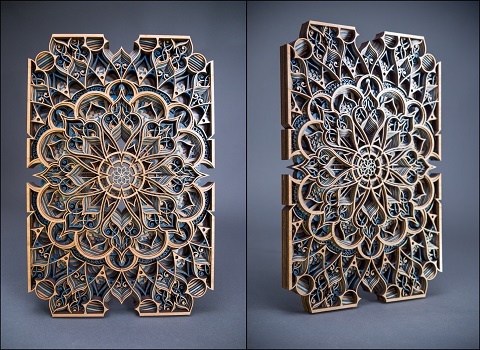 Working with a variety of precisely laser-cut pieces of super thin plywood, New Jersey-based artist Philip Roberts creates captivating layered-wood Relief Sculptures. They are built to inspire viewers and greatly enhance surrounding environments. 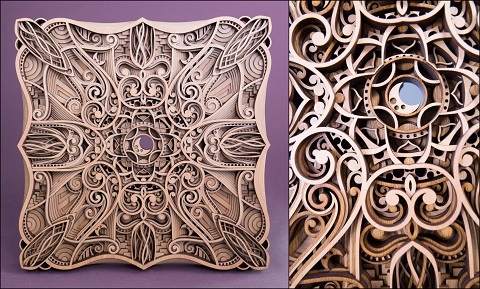 Building the intricate form starts from digital illustrations which are meticulously transformed into wood with his laser cutters. The individual components are then finished and glued by hand. 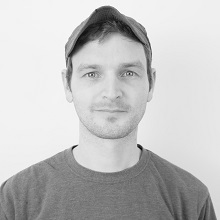 Coming from a career in custom wooden furniture, Phil aims to combine his love for woodworking along with his background in design. While initial ideas are sketched digitally, the physical form requires balancing design and function. The demands of building in physical supports systems throughout the artwork is a design challenge that increases the difficulty and the quality of the final relief aesthetic. Having to simultaneously balance form and function pushes the final design further than if those challenges didnt exist. Philip is a happily married, full time artist, from rural New Jersey. He relies heavily on his ability to use modern day technologies to bring his meticulous designs to life. 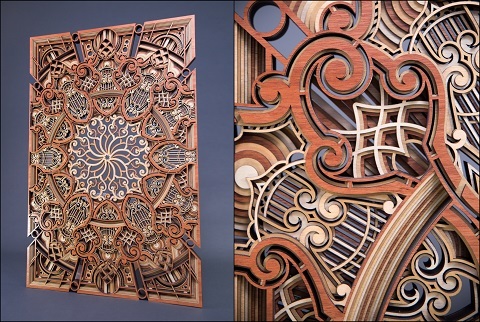 These abilities are born from his love of art, design, machinery, and a long history of traditional woodworking. Art should bring life to a living space and wood should bring the warmth. Philip aims to create a captivating yet calming viewing experience while bringing these two, absolutely essential, ingredients to any room.